Former UrbanCincy contributor Brad Thomas has been nominated to fill a vacant seat on the Southwest Ohio Regional Transit Authority’s (SORTA) Board of Trustees. Thomas currently works as an attorney with The Morgeson Law Office, and was appointed by the Cincinnati Mayor Mark Mallory (D). The 13-member board is comprised of seven appointees from the City of Cincinnati and six from Hamilton County which also uses three of its appointments to represent Butler, Clermont and Warren counties. 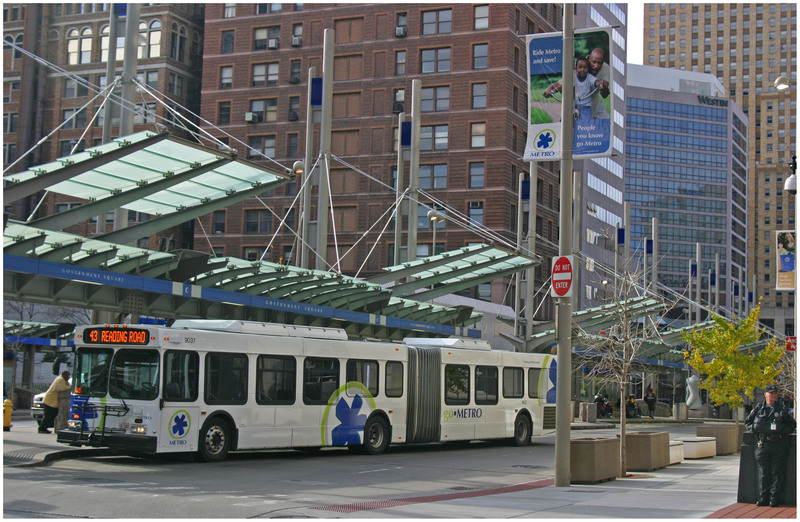 Government Square Transit Hub in downtown Cincinnati. Photograph by Randy A. Simes for UrbanCincy. Cincinnati City Council is expected to approve the appointment today at 2pm, which would clear the path for Thomas to officially join the SORTA Board of Trustees on May 1. In an exclusive interview with UrbanCincy, Thomas said that he intends to focus his attention on integrating the Cincinnati Streetcar with the existing Metro bus system, while also promoting enhanced bus service and bus rapid transit corridors. To date, Thomas has perhaps been best known for his work promoting the Cincinnati Streetcar. Since 2008, he has served in a variety of public involvement and engagement roles including, but not limited to, the operation of the CincyStreetcar Blog and the defeat of two anti-rail transit campaigns waged in 2009 and 2011. Thomas currently resides in Cincinnati’s historic Over-the-Rhine neighborhood, and is an active member of the Over-the-Rhine Brewery District, Cincinnatians for Progress, and is a former trustee of Clifton Town Meeting and the Mayor’s Young Professionals Kitchen Cabinet. His appointment will make him the youngest-ever SORTA board member, eclipsing the record established two years ago by Tom Hodges. Thomas will fill the unexpired term of Jason Riveiro. His appointment will become effective May 1, 2012.